A High Priestess of the barbarian hordes, an undead Wild West gunslinger, and a Second Lieutenant of the Intergalactic Security Forces are about as different as they come, but they've got one thing in common: they need a strong engine to drive their stories. Fate Core is that engine. 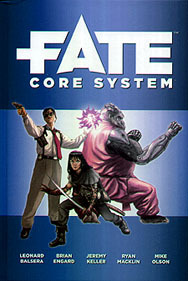 Fate Core is the latest evolution of the award-winning Fate roleplaying game system from Evil Hat Productions. We've streamlined and clarified the rules while maintaining the system's trademark flexibility. Name your game; Fate Core can make it happen. Rock-solid storytelling advice for players and GMs to produce the best play experience. Clearly-defined systems to guide players both new and old. New and improved approaches to character actions, aspects, compels... and more! Tell your Tale. Roll the Dice. Embrace Your Fate!